After a gap of at least two centuries, sourdough bread is making a comeback in Britain. But bread is notorious for not always being quite what it seems. In an echo of 19th century adulteration, some outlets are now putting the sourdough label on loaves that are far from the real thing. Andrew Whitley, co-founder of the Real Bread Campaign, author of Bread Matters and DO Sourdough – Slow Bread for Busy Lives, argues that ‘Real Sourdough’ needs legal definition via an Honest Crust Act to protect the public from ‘pseudough’. Sourdough is a spontaneous fermentation of flour and water in which naturally-occurring yeasts and beneficial lactic acid bacteria work in symbiosis to aerate and flavour bread, make nutrients more bio-available and improve digestibility. It is not an ingredient or an additive, but a process involving all the flour, and time is of the essence. Lactic acid bacteria work slowly, taking many hours to bring about the changes in dough which account for the growing popularity of this kind of bread – its distinctive flavour and texture and an ease of digestion which countless consumers contrast with the discomfort that can follow consumption of fast-made, additive-laden industrial loaves. The list of benefits from sourdough fermentation is long and growing, as molecular science unpicks the subtle services performed by bacteria in our food and bodies. Above all, it is clear that good things take time to happen. Each naturally-occurring yeast cell in a sourdough needs about two hours to divide into two. By the time the yeast cells are producing sufficient carbon dioxide to raise the dough, the lactic acid bacteria (which also depend to some extent on yeast by-products) have had a chance to begin their work of transformation. Eventually their acid by-products suppress yeast activity, even as they suffuse the dough with natural anti-fungal and anti-bacterial substances. The naturally slow tempo of sourdough fermentation is a nuisance for the ‘time-is-money’ school of food processors. So they ignore it. Breads called ‘sourdough’ are appearing (notably in supermarkets) which appear to be no more than ordinary dough – with all the usual additives and undeclared ‘processing aids’ – plus a bit of dried sourdough powder. Judging by the presence of added baker’s yeast and by the flavour and texture, the dough won’t have been fermented for long enough to produce the qualities for which real sourdough is prized. “The sourdough boule is made following an industrial process. It wouldn’t be possible to get a sourdough bread with the correct volume without yeast. Note the self-serving explanation, with appearance and uniformity as drivers, not food value or integrity. This opportunistic cashing-in on an emerging market matters more than the kind of brand infringement or bogus claims of authenticity that food law, sometimes belatedly and sometimes imperfectly, penalises. Real sourdough isn’t just bread with a different shape or flavour. It has genuine value for people who appreciate, and in some cases rely on, the changes in nutrient availability and digestibility that occur only after prolonged fermentation. The purveyors of ‘pseudough’ loaves casually – some would say cynically – ignore these attributes because they are not evident to the eye. Using a live sourdough culture, not inactive dried sourdough powder added purely for taste and acidity. Without the addition of commercial yeast or other leavening agents (for example, baking powder). Without using other ingredients/additives as souring agents (for example, vinegar or yoghurt). This definition could have legal force if the Real Bread Campaign’s calls for an Honest Crust Act were heeded. Sadly there is resistance in some quarters to letting consumers know exactly what they are eating. And yet, manufacturers are required by law to label foods, including any of 12 specified allergens, the purpose being to tell people what they are eating and to warn them of any possible negative effects. Unaware of possible distinctions between different sourdough products. Liable to pay extra for something marketed with a false implication of quality. Liable to become confused if a bread calling itself ‘sourdough’ fails to deliver the digestive experience previously associated with this type of bread, which in turn may lead to the whole sector being undermined, to the obvious detriment of real sourdough bakers. A ‘Real Sourdough’ designation would require both ‘must not contain’ and ‘must be fermented for x hours’ clauses. Agreeing the number of hours may prove contentious, but defining and labelling a food maturation process seems to work for cheese and vinegar (not to mention wine and whisky), so it shouldn’t be impossible, and it may well stimulate much-needed research into the undoubted benefits of making bread slowly. For those with less patience for lawmaking than for real bread making, there is an obvious way of avoiding ‘pseudough’. Making your own sourdough is easy. Illiterate and innumerate people did it for millennia, and all it required was flour, water and time. It still does. And if we feel at a disadvantage to our ancestors in having less time at our disposal these days, the good news is that sourdough baking can easily be slotted into those rare unspoken-for moments. Being naturally slow, sourdough accommodates itself to fast lives rather than competing with them. Perhaps we could learn from its rhythms. In September 2013, Andrew Whitley launched the UK’s first organic sourdough starter and a new community called the Fungal Network, a place to meet and share sourdough, stories and baking skills. 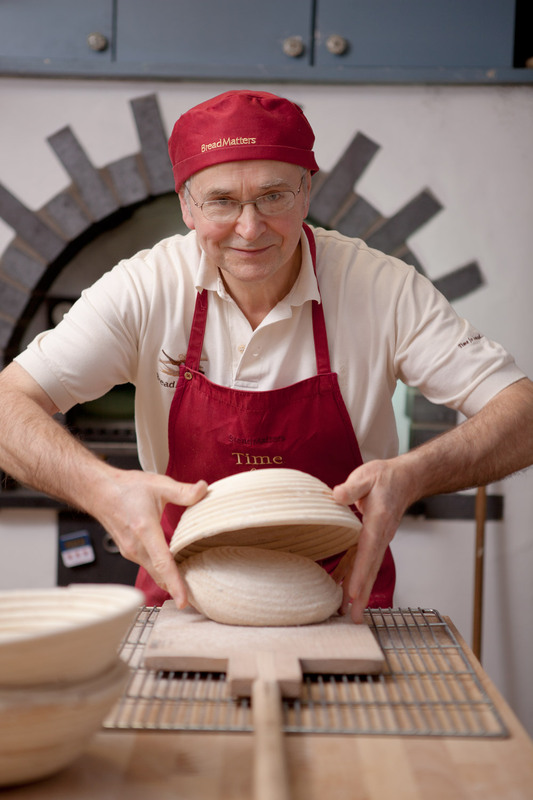 Andrew started the Village Bakery in Cumbria in the 1970s and co-founded the Real Bread Campaign in 2008. In 2003 he created Bread Matters to raise awareness of how good bread can be if we get it right. Andrew’s book Bread Matters and his famous courses have helped spark the new home-made bread revolution and have ensured that sourdough is at its heart. The next Bread Matters Sourdough Special course is on 6-7 September 2014. Do Sourdough: Slow Bread for Busy Lives by Andrew Whitley is published by the Do Book Company on 1 May 2014, price £8.99 from all good bookshops. Signed copies of Do Sourdough (and starters) are available from the Bread Matters web site.